Our company has started as legal marketing company and we are still very much activating in this niche. At this moment we are offering legal marketing services to lawyers and legal specialists in over 50 countries! 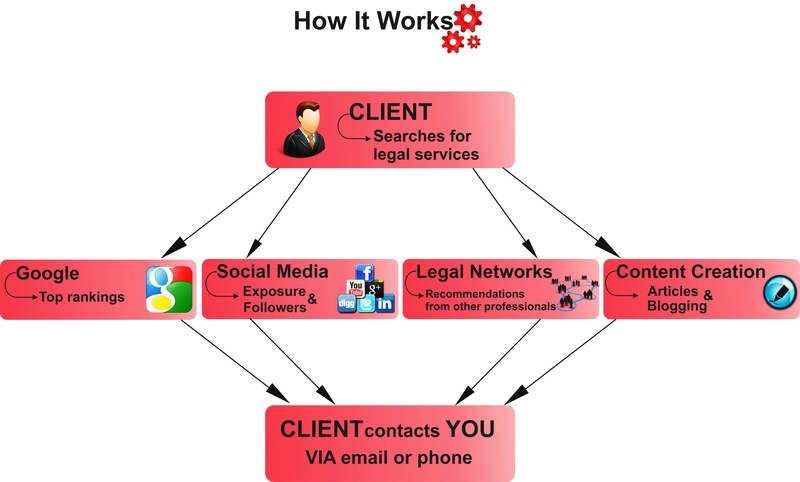 When it comes to online marketing for lawyers we offer full solutions. That means that all you have to do is contact us and let us know what type of clients you would like to recruit (your legal niche) and we will provide a complete strategy and solution (the initial analysis is free). Until now we have sent our affiliates thousands of initial client requests. Please see our Testimonials page to see whether they are happy with our services. In any case we offer a free trial period so you can test our services! Do I have to have a website? No. In most cases we market your services on our own network of websites (we have over 100 legal-oriented websites). We create websites/blogs/other media accounts especially for you, the type of legal services you provide and your location. Do I have to do anything beforehand? No. We take care of everything: website creation, marketing strategy, content writing, social media interaction & any other methods that might attract clients. Do I have to provide any upfront payment? No. We do provide a free trial period during which you can test our services and see the quality of our work. Can we start our collaboration immediately? Yes, however it could take some time before being able to come up with client requests depending on certain specifics (location, legal niche, language etc.). Is any lawyer eligible to collaborate with ClientPedia? No. We work with dozens of lawyers around world; however we only provide marketing services in certain locations and legal niches where we believe we can attract clients. All of our affiliates have to undergo a review before starting to market their legal services. Contact us to verify whether we can collaborate!